Overlooking the Peruvannamoozhi Dam, Aquarius Cottage offers comfortable accommodation in Calicut. The property can be reached from the Thalayad Bus Stop, which is 8 km away.There are in total two well-appointed cottages that are equipped with essential requisites. 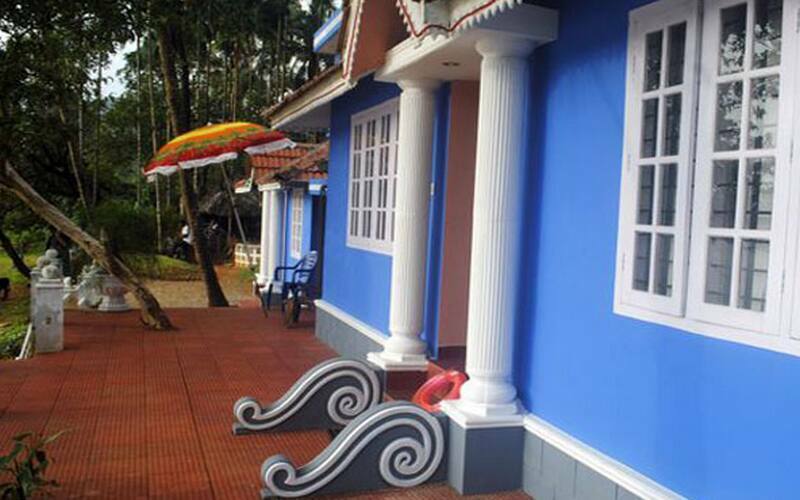 Amenities available in the cottage include television set, wardrobe, makeup mirror and attached bathroom with hot/cold running water.Apart from good accommodation in Calicut, Guests are offered Kerela village cuisine on request. It also arranges sightseeing and vehicle for its patrons. Luggage storage, laundry and medical assistance are a few of the other conveniences offered by the guest house.Koyilandy Railway Station is 35 km and Calicut International Airport is 66 km away from the property. Nearby points of interest to drop by include Thusharagiri Waterfall (35 km) and Kappad Beach (38 km). First night cost (including taxes & service charge) will be charged if you cancel this booking later than 26-Apr-19 12:00 PM IST. A beautiful retreat away from it all. We spent two weeks in this idyllic setting next to the lake. Two spacious bedrooms were ideal for us to spread out and the covered veranda wsa perfect for watching the changing light, birdlife and general goings on of local life. We had an amazing cook called Vasantha who provided us with breakfast, lunch and dinner plus mid morning snack and afternoon tea. Raji took us up to the dam and a few walks. Overall a delight of a place if you want to chill out. If you are looking for a little bit of down time to just do nothing, read a book, stare up into the mountainous jungle or gaze across the reservoir then this is the place for you. We arrived after a 6 hour drive just after dark and were welcomed by Anna; a lovely lady who lives close by that would be our guide, cook, cleaner and everything in between. We spent our days walking around the reservoir or reading on the wonderful veranda that overlooks it, playing cards and generally just taking in the beautiful surroundings. The food we were prepared surpassed our expectations and was wonderful at every meal, Anna really can cook some great 'keralan' dishes, she'll even show you how to do it too if you wish! And if you want to be completely alone then she can prepare your food in advance and return home for the evening and come back for breakfast. They're is a very small village about 15 mins walk or a short tuktuk ride away that sells the basics if you should require anything or just tell Anna and she will arrange for it to be brought to the house. Do not underestimate what you are getting involved in by staying at Aquarius; it is remote and unless you can entertain yourself with your surroundings then you may struggle here. I would highly recommend a stay here if you just want to get away! We had a marvelous stay and thanks to the wonderful service rendered!!! We had a wonderful stay at Aquarius Cottage. This is the perfect place to enjoy monsoons. The view of the lake is incredible and the house is beautiful, clean and spacious. The cook Anna did a great job. The food she made was delicious. The caretaker was helpful in providing all necessary amenities and housekeeping. Highly recommended if you wish to enjoy monsoons and sit and relax. Stayed here over a weekend with a group of four friends. Appearing nice on the outside in a lovely setting, this deceptive place is owned by doctor James who started off thru email contact very polite. Then after staying one night we saw how dirty and poorly maintained the room was and realised we were paying too much for this poor standard, so after discussing with dr James, after much conversation we got the room cleaned and he finally discounted the rate a little, but the rate was still more than other places we stayed at. We decided to stay in the peaceful setting, there was no other accommodation in the area. Then after staying a few days Anna, the 'nice' lady who was 'looking after' us failed to communicate the costs of various items which we had not agreed on. Then when the bill comes, a big surprise when the items were overcharged, we were being charged for items we didn't request nor consume. We refused to pay for those items and disputed this with Anna. Dr James was blamed, Anna did not take responsibility for her role and took sides with Dr James. They demanded full payment for all items whether consumed and requested or not. After this it was clear they don't care about customers and their experience, he as well as Anna care more about the money. On our last night, when we received the bill and were threatened that either we pay or we "don't be allowed to leave", we decided to pay the amount requested and leave immediately rather than stay in such an unethical environment. Then on deciding to leave, they start adding additional things to our bill, such as taxi cancellation fee because we won't need the taxi for the following day anymore now that we decide to leave. Then, later, while waiting for our own taxi, dr James now wants to charge for ANOTHER NIGHT! Because it's a small village our own taxi knew Dr James and Dr James told him not to take us until we paid. So my wife and I were HELD RANSOM by what felt like everyone in the village because of this man who seems to have everyone's respect or fear. We had to pay the ridiculous amount to get out of there. I'm really disappointed with the way we were spoken to and dealt with. Dr James said threatening remarks on the phone like "I'll teach you a lesson" and "who do you think you are", he never once came to the cottage during our stay, HE COULDN'T CARE LESS. We hope other guests don't have a similar experience, a real pity because the area is nice but with no other accommodation options they think they can bully and disrespect guests. This is supposed to be 'govt approved' which is worrying, I will report this to the tourism dept. THIS ACCOMMODATION SHOULD BE BLACKLISTED! Either of the two rooms work well.